Agnès Varda says her Oscar nomination is nice, but "nothing to be proud of"
Agnès Varda has been making movies for more than 60 years without any Oscars, so what would she need one for now? That’s the essence of the 89-year-old French filmmaker’s comments to the Associated Press about her dual nods from the Academy this year, one in the Best Documentary Feature category with her daughter Rosalie Varda and street artist JR for their film Faces Places, and one honorary Governors Award, which she received along with filmmaker Charles Burnett and actor Donald Sutherland last fall. And, well, it was nice—but nothing to base your self-esteem on. “There is nothing to be proud of, but happy,” she says. “Happy because we make films to love. We make films so that you love the film ... I love my own work and I’ve done it for so many years, so I didn’t do it for honor or money. My films never made money.” They have won Varga accolades at film festivals around the globe, and a place among the greatest arthouse auteurs of her generation. Oscars, though? Not so much. This year marks the first time Varda has ever been nominated for an Oscar in her long and celebrated career, also making her the oldest Oscar nominee in history. Varda’s “eh, whatever” attitude towards the Oscars extended to the annual nominees luncheon, the celebrity-packed pinnacle of Hollywood’s self-adulatory awards season where, as Vanity Fair puts it, “Even Steven Spielberg wants a selfie.” In her stead, Varda sent co-director JR and three life-sized cardboard cutouts—one of which shows her clutching a cat—to the luncheon, “posing” for pictures with the other attendees and in the “class photo” of all of this year’s nominees next to a delighted-looking Greta Gerwig. Varda’s official excuse was that she was too tired to attend the luncheon—she is 89, after all—but we like to imagine there was some “can’t be bothered” in there as well. 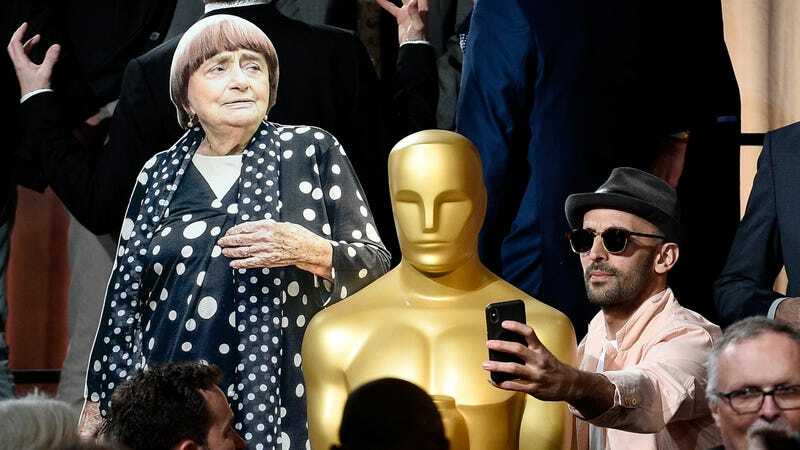 Varda will be attending the Oscars ceremony proper on March 4, though, given that she was invited as a Governors Award recipient months before her nomination for Faces Places. You can see a couple of candid shots of “Agnès” posing with her fellow nominees, along with a group photo with “Agnès” in the upper right-hand corner, below.